Azathioprine is an immunosuppressant purine analog and prodrug of mercaptopurine. It is used in a variety of rheumatological and immunological disorders such as systemic lupus erythematosus, Behcet's syndrome, inflammatory bowel disease, and inflammatory eye diseases. A dreaded complication that requires close monitoring is myelosuppression manifesting as cytopenias. Apart from mild myelosuppression (often dose related), an “idiosyncratic” potentially fatal severe myelosuppression can also occur. This previously called “idiosyncratic” adverse effect has been found to be related to genetic variations. Importantly, physicians need to recognize early clinical clues to the impending development of myelotoxicity. One important clue that may be useful is the occurrence of alopecia. This report describes the case of a young lady who developed alopecia (progressing to totalis) before bone marrow suppression and on genotyping was found to be NUDT15 mutation positive but TPMT mutation negative. We subsequently searched the literature and found several such cases, in which alopecia occurred concurrently or before cytopenias due to azathioprine; some of these have studied mutations in TPMT and NUDT15. A 35-year-old female was evaluated for headache and bilateral decreased vision for 15 days, under the ophthalmological services. Her visual acuity was limited to perception of hand movements on the right side and finger counting up to 2 m on the left side. She underwent fluorescein angiography and optical coherence tomography scan that revealed features suggestive of bilateral Vogt–Koyanagi–Harada syndrome (VKH syndrome). She was given three pulses of methylprednisolone (1 g), followed by oral prednisolone at a dose of 1 mg/kg/day. Her routine hemogram was normal. As a steroid-sparing agent, azathioprine was started on a daily dose of 50 mg. After a week, her azathioprine dose was increased to 100 mg (2 mg/kg/day). 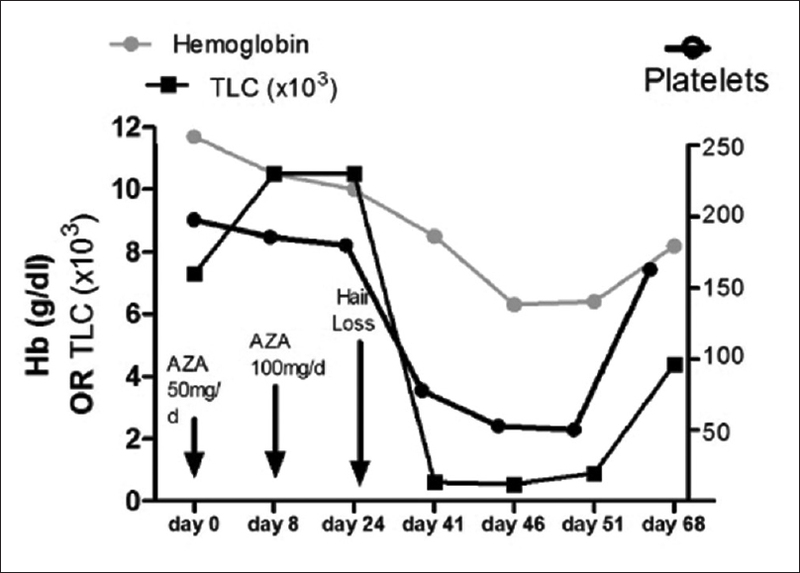 Two weeks after the initiation of azathioprine, she complained of increased hair loss; however, her hemogram was normal and she was continued on azathioprine at the same dose. At the 6th week, she returned with patchy hair loss, loss of eyebrows, fever, and productive cough. Investigations revealed pancytopenia (hemoglobin 8.5 g/dl, total leukocyte count 600/μL, and platelet count of 78,000/μl) with high erythrocyte sedimentation rate and C-reactive protein (135 mm in the 1st h and 290 mg/l, respectively). Azathioprine was stopped and broad-spectrum antimicrobial drugs were started, with which her counts gradually improved [Figure 1]. Skin biopsy from the site of hair loss revealed features suggestive of alopecia areata with increased number of telogen hair and follicular stella. 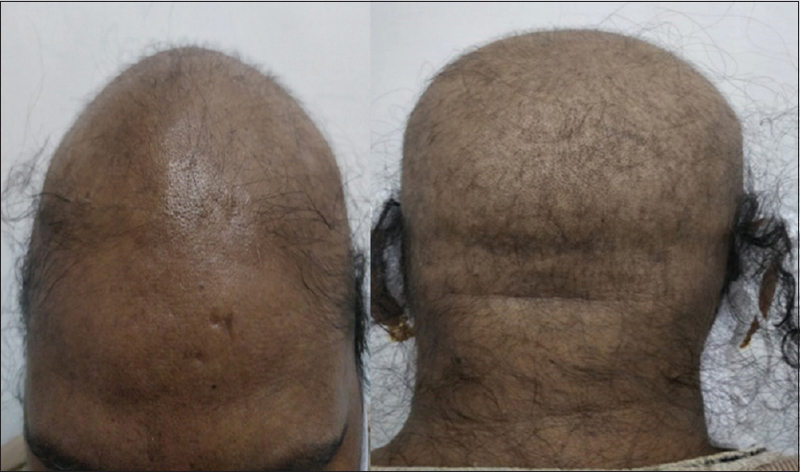 Over the next 1 month, she developed complete balding (alopecia totalis) [Figure 2]. One month later, her blood counts had normalized except anemia – hemoglobin 8.2 g/dl, total leukocyte count 4400/μl, and platelets count of 163,000/μl. TPMT and NUDT15 mutation studies were performed elsewhere (see acknowledgments). Amplification refractory mutation system–polymerase chain reaction was employed for NUDT15 genetic variant and TPMT *2 variant genotyping, whereas restriction fragment length polymorphism technique was employed for genotyping of TPMT *3A, *3B, and *3C genetic variants. Her TPMT genotype was wild type, but she had homozygous NUDT15 mutation (C415T). She was subsequently started on methotrexate (weekly) as a steroid-sparing agent. On 2-month follow-up, she had complete normalization of her hemogram with regrowth of hair [Figure 3]. Apart from these case reports, alopecia with myelosuppression has been reported from larger studies in patients on azathioprine, many of which reported genetic associations. In a study of lupus patients from China, five patients who developed alopecia and myelosuppression were reported. Three were heterozygous for TPMT *3C and two were homozygous for this mutation. Interestingly, the authors of that paper have also speculated that alopecia could be a marker of myelotoxicity of azathioprine. Similarly, there have been studies looking at the NUDT15 C415T mutation since its description 4 years ago. In a study from India, NUDT15 genetic variation was found in 9 out of 69 patients. The one homozygous patient (NUDT15*TT) developed pancytopenia and severe hair loss mentioned in [Table 1]. Among the eight heterozygous patients (NUDT15*CT), five developed cytopenias and one developed alopecia. In a series from Korea, all five NUDT15 TT homozygous patients developed early severe leukopenia and alopecia. The authors reported a strong association of the NUDT15 mutation with early leukopenia (odds ratio of 107.6) and severe alopecia (odds ratio of 77.2). TPMT enzyme is encoded by TPMT gene on chromosome 6p22.3, which exists as normal wild type (TPMT *1/*1) or multiple variant alleles. Four of the variant alleles (TPMT *2, *3A, *3B, *3C) are responsible for <95% of mutations and variable levels of enzyme activity. In India, the prevalence of TPMT mutations has been reported to vary from 1.2% to 10% (heterozygous), whereas <1% have been reported to carry homozygous mutations.,, A study conducted by Garg et al. among 176 Indian patients with various autoimmune disorders who were on azathioprine and developed myelosuppression found a low prevalence of TPMT mutation (1.7%). A study from South India by Murugesan et al. reported the prevalence of TPMT mutations to be 2.8%, with TPMT *1/*3C being the predominant alleles. As alluded previously, the NUDT15 variant (gene ID: 55270; rs116855232; C415T; encoding p. Arg139Cys) has recently been described to be associated with myelosuppression (initially in Korean patients). In a study by Shah et al. in Indians, NUDT15 variant was present in 19.4%. Interestingly, all those who developed leukopenia on thiopurine treatment had NUDT15 variant in that study. Although larger studies need to be carried out, NUDT15 variant testing seems to be at least as important as TPMT testing in Indians. The common mechanism driving the toxicities of alopecia and myelosuppression could be cell death – hematopoietic precursor and root cells in the hair bulb. This could be due to the accumulation of thiopurine toxic metabolites, metabolism of which depends on two genetically influenced enzymes – TPMT- and NUDT15-encoded Nudix hydrolases [Figure 4]. 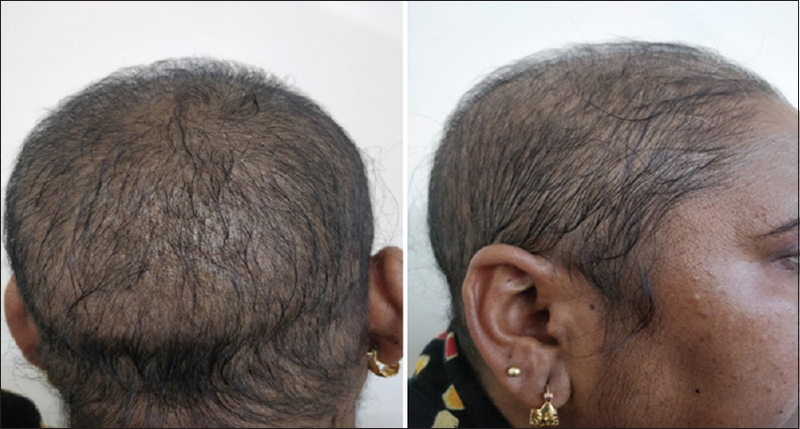 To conclude, this case serves to highlight the importance of a simple clinical clue such as alopecia that can be a harbinger of severe myelosuppression in patients on azathioprine. Further, it emphasizes the need to look for NUDT15 mutation (apart from TPMT) in these patients. The authors thank Dr. Tester F Ashavaid, Director (laboratory research) and consultant biochemist at the P.D. Hinduja Hospital & Research Center, Mumbai, for her assistance in processing the sample for TPMT genotyping and NUDT15 mutation analysis. Jacob M. Van Laar. Immunosuppressive drugs. In: Firestein GS, Budd RC, Gabriel SE, McInnes IB, O'Dell JR (Eds). Kelley and Firestein's Textbook of Rheumatology. 10th ed. Philadelphia, PA: Saunders/Elsevier; 2017. p. 987-9. Yang SK, Hong M, Baek J, Choi H, Zhao W, Jung Y, et al. Acommon missense variant in NUDT15 confers susceptibility to thiopurine-induced leukopenia. Nat Genet 2014;46:1017-20. Relling MV, Gardner EE, Sandborn WJ, Schmiegelow K, Pui CH, Yee SW, et al. 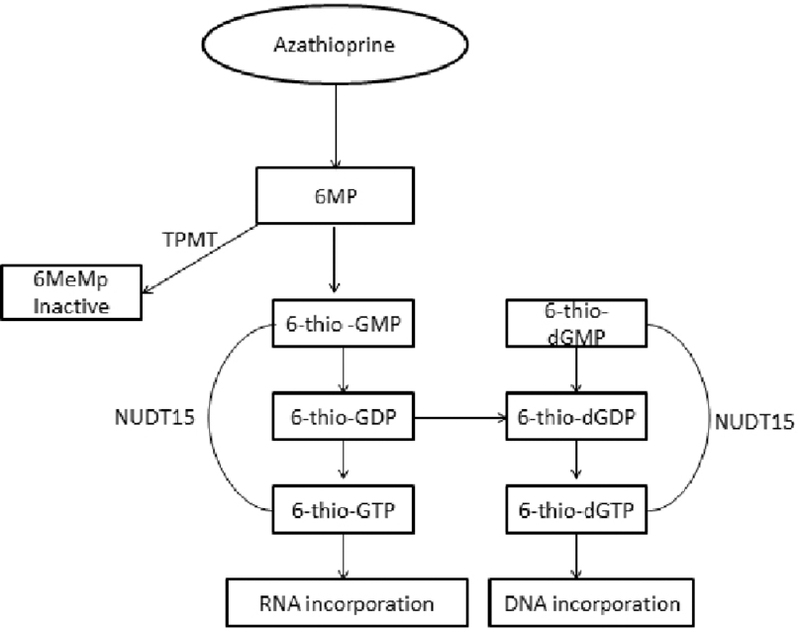 Clinical pharmacogenetics implementation consortium guidelines for thiopurine methyltransferase genotype and thiopurine dosing: 2013 update. Clin Pharmacol Ther 2013;93:324-5. Payne K, Newman W, Fargher E, Tricker K, Bruce IN, Ollier WE, et al. TPMT testing in rheumatology: Any better than routine monitoring? Rheumatology (Oxford) 2007;46:727-9. Kim JC, Kim YK, Hyun HS, Park EJ, Kang HG, Ha IS, et al. Acase of azathioprine induced severe myelosuppression and alopecia totalis in Iga nephropathy. Child Kidney Dis 2017;21:35-9. Bhokare AB. Azathioprine-induced alopecia as an early clinical marker of its myelotoxicity. Indian J Drugs Dermatol 2017;3:40-1. Balasubramanian P, Jagadeesan S, Anjaneyan G, Thomas J. An interesting case report of azathioprine-induced anagen effluvium. Indian J Dermatol 2015;60:324. Sonthalia S, Daulatabad D. Azathioprine-associated anagen effluvium. Indian J Dermatol Venereol Leprol 2016;82:322-4. Chen D, Lian F, Yuan S, Wang Y, Zhan Z, Ye Y, et al. Association of thiopurine methyltransferase status with azathioprine side effects in Chinese patients with systemic lupus erythematosus. Clin Rheumatol 2014;33:499-503. Shah SA, Paradkar M, Desai D, Ashavaid TF. Nucleoside diphosphate-linked moiety X-type motif 15 C415T variant as a predictor for thiopurine-induced toxicity in Indian patients. J Gastroenterol Hepatol 2017;32:620-4. Kim SY, Shin JH, Park JS, Kang SY, Nam TS, Kim JK, et al. NUDT15 p.R139C variant is common and strongly associated with azathioprine-induced early leukopenia and severe alopecia in Korean patients with various neurological diseases. J Neurol Sci 2017;378:64-8. Garg A, Arya V, Duggal L, Kotwal J. Thiopurine S. Methyltransferase (TPMT) mutation prevalence and myelosuppression frequency in North Indian patients with autoimmune disorders. J Assoc Physicians India 2018;66:39-44. Kapoor G, Sinha R, Naithani R, Chandgothia M. Thiopurine S-methyltransferase gene polymorphism and 6-mercaptopurine dose intensity in Indian children with acute lymphoblastic leukemia. Leuk Res 2010;34:1023-6. Murugesan R, Vahab SA, Patra S, Rao R, Rao J, Rai P, et al. Thiopurine S-methyltransferase alleles, TPMT(*)2, (*)3B and (*) 3C, and genotype frequencies in an Indian population. Exp Ther Med 2010;1:121-7. Shah SA, Paradkar MU, Desai DC, Ashavaid TF. Preemptive NUDT15 genotyping: Redefining the management of patients with thiopurine-induced toxicity. Drug Metab Pers Ther 2018;33:57-60.